Who doesn’t love to click themselves these days? Selfie is the growing trend in the world among people of all generations. For all the selfie fanatics out there, we present you with the Coolpad Mega 2.5 D smartphone; a phone recently launched in India for making your selfie experience worth every penny. Cost effective, durable and worth every cent is what Coolpad Mega 2.5D is. Priced at Rs 6,999, this smartphone is going to be out for sale exclusively with Amazon from 24th of August 2016. The registrations have already begun for the same. Hurry! Sleek and Smart with a matte finish is what this new smartphone is all about. Weighing only 140 grams makes this the lightest phone ever. 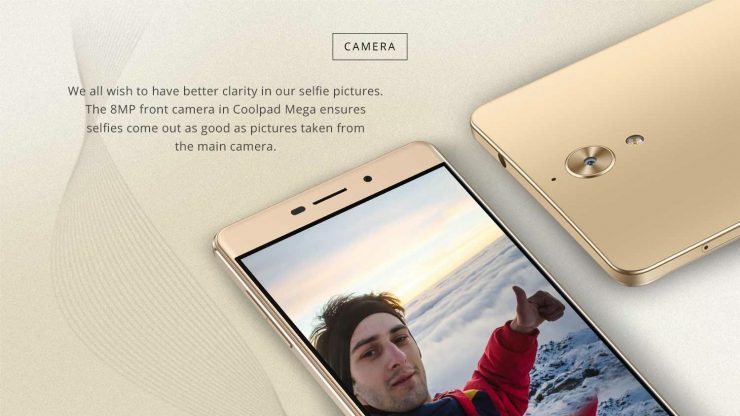 The Coolpad Mega 2.5D provides with a great 8 MP front and back camera, making your photography and videography stand out from other smartphones. The 8-megapixel front camera is perfect for selfies and never would have your selfies looked so clearer and brighter than those clicked with this phone. The phone offers a higher resolution camera than most of its competitors offer in this price range. Also, the smartphone has a f/2.2 aperture with the 83.6-degree field of view. One of the innovative features of the front camera is that it comes with the inbuilt Beautification mode which automatically detects the age. Thus, say Good-Bye to all the apps that you download to beautify your selfies. Along with telling the age of users, the camera also gives individual names like Heartthrob, Nymph, and McDreamy. These two facts: name and the age are displayed on the top of the user’s face. In the gallery, two same pictures, one with name, age and second without them are stored. Although, you can change this from the settings. That’s why the phone is labeled as the apt selfie phone. Coolpad mega 2.5D offers our customers with dual sim function and has a storage capacity of 16GB (with expandable storage space of up to 32GB), would be very convenient when it comes to storing your pictures and videos. 5.50 inches’ screen size with a 1GHz Quad core processor and a 3 GB RAM makes it the best buy you can ask for. Having a good battery backup in such busy lifestyles is also a key feature one looks out for when looking for a smartphone. So, Coolpad Mega 2.5D provides with a 2500Mah battery backup giving you plenty of time to work on your phone without being worried about the battery running out. Android Version of 6.0 marshmallow is used in this phone, and it supports 4G network too. Coolpad mega 2.5D gives its customer options to play around with their pictures by using the smart beautification mode, which helps to edit and customize photos. The smart beautification mode is clever enough to tell you your age depending on your pictures. So, buy the phone right away and click as many selfies as you wish to! Where to buy Coolpad Mega 2.5D from? You can easily buy this affordable phone at a cost of only Rs 6,999 by registering yourself with Amazon.in, as the sales start from 24 August 2016. Have a great selfie experience with a great battery backup and all the essential features you look out for in your phones. Coolpad mega 2.5D is your big phone big screen buy, durable, user-friendly with a lot of space to store up your apps, pictures, and videos. What are you waiting for? Register yourself at Amazon.in now.